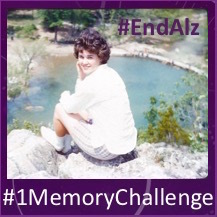 robin%2Bperini » #1 Memory Challenge – You Are Not Alone! 2) Increase awareness of Alzheimer’s Disease, those living with this illness and their caregivers. 3) Encourage donations to the Alzheimer’s Association and other organizations that support the vision of a world without Alzheimer’s. I pray for that day! One of Alzheimer’s most devastating impacts is the loss of memory. I wish that I could ask my mother questions and that she could share her memories with me. I challenge each of you to share a memory that you might want share with yourself should you lose the ability to remember or that you wish to share with your friends and family. OR, perhaps you’d like to share a question or something you wish you could do with someone whose memory has failed. It’s as simple as that! Want to see some examples of some #1MemoryChallenges! Click right here! Want to know how to post a video? Click right here!